Perennial. Cataphylls evident. Rhizomes elongated. 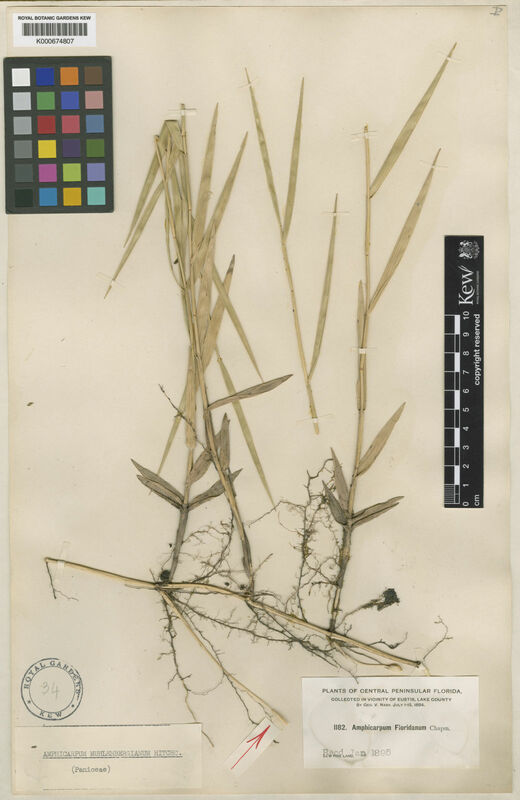 Culms erect, or geniculately ascending; 10-70 cm long; rooting from lower nodes. Lateral branches sparse. Leaves cauline. Leaf-sheaths ribbed; hispid. Ligule a fringe of hairs. Leaf-blade base simple, or broadly rounded. Leaf-blades lanceolate; (0.5-)3-10 cm long; 5-10 mm wide; herbaceous to coriaceous. Leaf-blade surface smooth, or scaberulous; glabrous. Leaf-blade margins cartilaginous. Inflorescence a panicle, or composed of racemes. Panicle open; lanceolate; 10-25 cm long; contracted about primary branches. Primary panicle branches distant; 1 -nate; indistinct the panicle almost racemose, or simple; 1.5-15 cm long. Panicle branches scaberulous. Racemes 1-4; single, or borne along a central axis; 1.5-15 cm long. Central inflorescence axis 5-10 cm long. Spikelets ascending, or appressed; solitary. Fertile spikelets pedicelled. Pedicels filiform; 1-8 mm long; scabrous. Spikelets comprising 1 basal sterile florets; 1 fertile florets; without rhachilla extension. Spikelets elliptic; dorsally compressed; acuminate; 6-7 mm long; falling entire. Glumes dissimilar; reaching apex of florets, or shorter than spikelet; thinner than fertile lemma. Lower glume ovate; 1 mm long; 0.1-0.2 length of spikelet; membranous, or scarious; without keels; 1 -veined. Lower glume lateral veins absent. Lower glume apex obtuse. Upper glume lanceolate; 0.9-1 length of adjacent fertile lemma; membranous; without keels; 5 -veined. Upper glume apex acute. Basal sterile florets barren; without significant palea. Lemma of lower sterile floret similar to upper glume; elliptic; 1 length of spikelet; membranous; without keels; 5 -veined; acute. Fertile lemma elliptic; 5.5-6 mm long; coriaceous, or indurate; without keel; 5 -veined. Lemma lateral veins transversely connected at apex. Lemma margins involute. Lemma apex apiculate. Palea elliptic; 1 length of lemma; indurate; 2 -veined. Palea surface papillose. Palea apex acuminate. Lodicules 2; cuneate; 0.5 mm long; fleshy. Anthers 3; 4 mm long. Stigmas 2. Ovary glabrous.